Crossing the expanse of Spain from Santiago to near the French border is another Camino of discovery in the small town of Tarragona. It is a touristy area with parks, beaches and attractions and it’s proximity to the south of France is influenced with expressions of Spain and France. Located at a sea side park is the Labyrinth de Aqua, a spiraled labyrinth of water that becomes illuminated in the evenings for visual beauty and a joyous playful respite from the heat. Designed for its functionality and for its visual appeal, the labyrinth is finding its way in the world. Traveling north to Paris another fountain calls attention to the work of sculpture Margaret Pan. In the 1980’s a surge of artistic restoration began in hopes of bringing a balance of spirituality to the communities of Old Paris and through a contest, Pan became the selected artist representing the simplicity of flow in water and white near Belleville district’s park area between the 11th and 19th arrondissements. 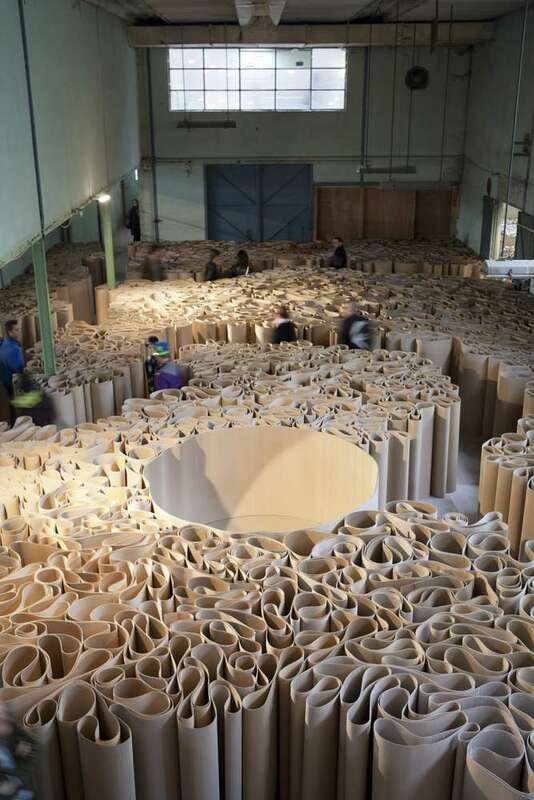 With more appreciation for the application of the labyrinth as Art, designer Micheal Pistoletto impresses France with his artistic labyrinth rendering in 2100 meters of corrugated cardboard at the Galleria Continua Les Moulins only about an hour away from the fountain sculpture in Paris. The labyrinth is many things to many people and in crossing the border from Spain to France and transcending the labyrinths of prehistoric carvings and glyphs to the medieval majesties into the times of our present lives, the labyrinth might be an expression of our civilizations passion and purpose. Our purpose of the month is to explore, our purpose of the year is to discover the possibilities of our truths. In the fascinating countries that bring us such rich history, we are blessed to discover there is so much more open to interpretation. Explore the many ways you appreciate the labyrinth in both passion and purpose from the simple drawings to the permanent structures and the programs for others to the simple walks of reflection. One can find many surprises when wondering in nature, though it is a delight to come upon a tribute to it through art. High in the Andes Mountains there exists an open air sculpture park. Using the elements to leave a mark in the open wilds as if to say a humble thanks to what stretches out in grandeur before us. A Patagonian resident, Yamilla Marañón grew up in Argentina in the Mendoza area and at 20 years of age moved to Paris to study her passion for art. Seven years later she returned to the Andes and opened this open air museum. This glorious design using the rays of the sun from the stones and the soils is called “Xumec, the sun labyrinth. It was designed in 2012 and remains a marvel to view and venture into. The honesty of our year long program is designed to discover the abilities and gifts we each have and to use them in more significant and true ways to bring out the best in each of us and the best when we share those capabilities. Even in the places you don’t go to, the exploration is in how you find what you do, when you decide to explore. From a computer, this beautiful place is not etched into the heart and a journey to visit from a curious exploration. Explore the journey of your walking day between the labyrinth of the sun and the moon today. Our exploration this month is to discover the World Wide Wow in the unique and innovative labyrinth designs world wide that inspire us to move beyond the everyday and give us a larger labyrinthic look at what our path can truly provide. From the idea of living outside your box to simply doing something different everyday, allow this journey of June to educate you and your relationship to life with the labyrinth. We’e taking a global course in Labyrinthing! Investigate the world wonders of labyrinth design that are unique and different. From the permanent structures that are built to the canvas portable unique designs or the finger labyrinths that inspire a different walk, share the images at the 365 Experience on the TLS website and provide some detail and share your thoughts. Note how these designs are outside the box of traditional design and how they might take us outside the design we’ve been living in. They can be quite diverse or small simple adjustments that make it different too. Let your walks, programs, designs, creations and simple enthusiasm be inspired by what the world offers us with fresh ways to create new experiences in the 30 days of this month. If it is doing something different each day, walking a new labyrinth, designing, researching or some new way to share, do it then share it with us! By becoming acquainted with the unique labyrinths of the world, we can be inspired as to why they are different, how they serve and what they offer on the same path we walk on in our home or local community area.